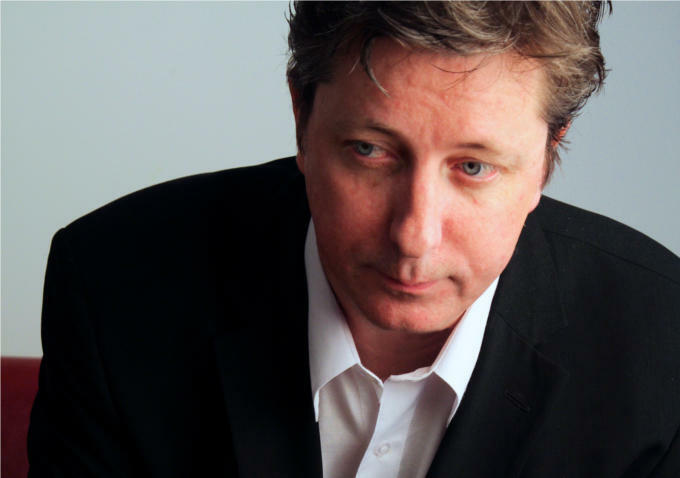 I don’t get Hal Hartley. But I like his casting choices. In case you are not familiar with Hartley’s work (heresy for any self-respecting cinephile back in the nineties) he was a name to know in the burgeoning independent film movement. I even rented The Unbelievable Truth starring the late (and, in my opinion, great) Adrienne Shelley just to see what all the fuss was about. Speaking of that recent Hartley effort, it is apparently part of a trilogy by the film-maker that began with Henry Fool (1998) and continued with 2007’s Fay Grim. 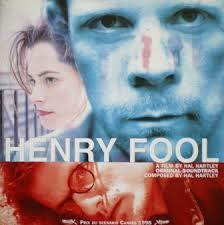 I vaguely remember renting Henry Fool at my local video store. I seem to recall it is about the relationship between an unassuming garbage collector, Simon Grim (James Urbaniak), who lives with his mother and highly libidinal sister, Fay (Parker Posey) , and a scruffy, egotistical wannabe poet named (you guessed it) Henry Fool (Thomas Jay Ryan). Turns out Simon is the one who becomes a world famous poet. I can empathize with the late Roger Ebert who, in a 1998 review of the film. wrote “I wonder if the fault is in myself. I don’t think this is a bad film, but after seeing it twice I’m unable to respond to it in any clear way. Things happen, and I don’t know what they mean, and I have a feeling that in Hartley’s view, they need not mean anything.” Frankly, I rented it because Parker Posey (her real name) is in it. I have had a film lovers’ crush on Ms. Posey ever since I saw her breakthrough role in 1995’s Party Girl. She has 92 TV and film credits on her resume, according to imdb, so I won’t list all of them but my favorites include The Anniversary Party, The Daytrippers, all the films she has made with satiric mastermind Christopher Guest (like Best in Show and Waiting for Guffman, for example) and her arc as Eli Gold’s ex on TV’s The Good Wife. She occasionally goes mainstream (Superman Returns, the failed TV series The Return of Jezebel James) but her best work (in my opinion) is in indie films. Anyway, Henry Fool climaxes with Henry and Fay hooking up and Fay Grim (currently on Netflix) opens with Fay talking to a teacher who has busted Fay’s 14 year old son, Ned (Liam Aiken) for possession of a pornographic movieola (which he has received anonymously in the mail.) Hartley has had almost a decade to come up with a backstory for Henry so now he is a former government agent who has travelled all over Europe, Latin America and the Middle East with dogged CIA agent Fulbright (Jeff Goldblum, indulging in every quirky mannerism in his playbook) in hot pursuit. Fay hasn’t seen Henry in seven years and, with Simon (Urbaniuk) in jail for aiding and abetting Henry in his escape, Fay worries that Ned doesn’t have a proper male role model. This leads to a very convoluted plot which may be a satire of espionage movies. Writer/director Hartley seems to take his plot machinations seriously at some point and the ending is rather sobering (to say the least). Ned Rifle, the third film in the trilogy (also on Netflix), starts in a lighter vein and ends on a somber note as well. In the process. Hartley adds a new player, Aubrey Plaza, to his ensemble ( another of my favorite performers. Don’t get me started). Strangely enough, I didn’t become a fan via her best-known role (TV’s Parks and Recreation.) It was an odd little indie film, 2012’s Safety Not Guaranteed, that made me a believer. I even watched Life After Beth and part of The To-Do List (although that movie was too much even for a newly minted Aubrey apostle to watch all the way through.) At any rate, Ms. Plaza, with her trademark deadpan delivery, seems tailormade made for the dry wit and eccentric dialogue that is part of Hartley’s signature style. In Ned Rifle‘s opening scenes, we learn Ned is now 18 (and still played by Liam Aiken) and planning to leave the Witness Protection Program where he has been living with Rev. Gardner (longtime Hartley vet Martin Donovan) and his family since his mom (Parker Posey, remarkably cheerful, considering Fay is serving a life sentence) was busted as an international terrorist. Ned’s first move: kill the man who ruined his mom’s life i.e. Henry. He first calls on his Uncle Simon (again played by Urbaniuk) who has discarded a career in serious literature to become a stand-up comic (“Only now,after all this heartbreak and controversy, am I able to confront my inner clown.”) Ms. Plaza, portraying a troubled, possibly psychotic young woman named Susan, keeps popping up along the way until Ned reluctantly takes her along on the journey to find his father (Henry, still depicted by Thomas Jay Ryan) . Ned wants to murder him. Susan has her own agenda. Ironically, this may be Hartley’s most accessible film to date. 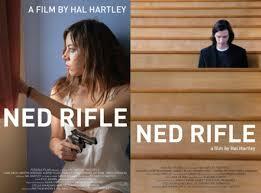 FITZROY on rottentomatoes.com wrote of Hartley’s Ned Rifle : “…. Not really sure what it is. I just liked all of it ….” and that typifies my reaction as well. As long as there are well-heeled fans and investors to fund his films ( Ned Rifle appears to be crowdsourced) it seems apparent that Hartley will continue to make his idiosyncratic little flicks. Like Simon in Ned Rifle he doesn’t seem to care whether he is popular or not.